Firefox/Chrome: Right Inbox is an extension for Chrome and Firefox that works with your Gmail account to schedule emails for sending later, much like Boomerang, but free and simpler. Scheduling emails could be helpful for quite a few reasons. One example is that you might know the recipient gets to their desk at around 10am, so you could schedule your email to be delivered at some point around that time. Otherwise, your important message could become buried by all of the other emails that the person has gotten since you wrote it. 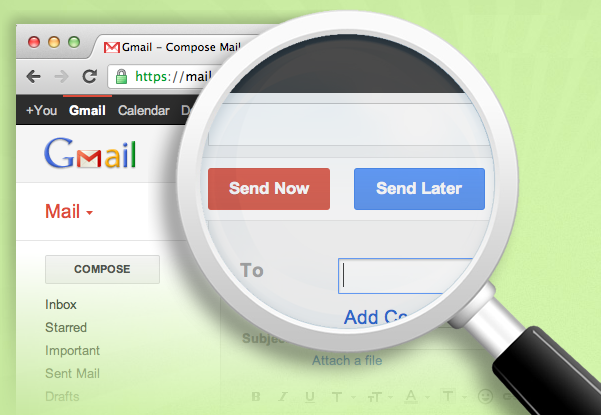 The add-on places a "Send Later" button in Gmail with options to schedule the email in 1, 2, or 4 hours or select a specific date and time and, optionally, time zone. It's very straightforward and intuitive—and useful. Use it to send yourself reminders or send emails to others at just the right time. Overall the app is lightweight and definitely worth installing and you might start seeing faster responses from the people you’re emailing if you start thinking about the best time to fire that important message off. If you want this feature and a whole host of others, definitely check out Boomerang, which is a paid alternative. Firefox 6 is available for download today, and Mozilla wants developers to know the release includes some special tools just for them. For developers, the most significant additions to Firefox 6 are the element, which displays system progress bars for tasks in progress; touch events, which support touchscreen functionality; and server-sent events, which allow server-side script to generate client-side events accompanied with data. Mozilla has also brought back WebSockets. WebSockets enable interactive communication between the browser and the server and are used for chat and gaming programs, among others. Another new feature in Firefox 6 is the Window.matchMedia API. “This is basically the media queries equivalent to querySelector, matchesSelector and friends,” writes Mozilla engineer David Baron. Simply put, the API will help you optimize your website or mobile web app across a range of devices and operating systems. You can check out other changes for developers at Hacks.Mozilla.org. The roll-out also included some improvements to Firefox for Android, including tablet-optimized interface features, a new homepage, better image rendering and a more “Android” look and feel overall. Firefox 6 comes quite swiftly on the heels of its predecessors. Firefox 5 only launched near the end of June 2011, and Firefox 4 made its debut just months before in the spring. What’s new in Firefox 6? The most notable addition to this new release are the<progress> element, touch events, Server-Sent Events as well as the return of WebSockets. view rawprogress.htmlThis Gist brought to you by GitHub. The standard Touch events are now available on both Firefox “desktop” and mobile, enabling users to interact with web pages using their fingers on a touch screen. Web browsers have created a great demand among the internet users. Every internet user wants to use the best browser which has high speed, privacy, security and user friendly features. Google Chrome and Mozilla have brought down Microsoft's Internet Explorer when it comes to percentage of usage. For past 5 years, IE has constantly been losing its demand among the internet users as other browsers provide more features, security, speed and compatibility. Yes, the browser war is heating up again and has become more vigorous today. Firefox remains to be the favorite browser among the web users. It is a free and open source web browser. This browser provides amenities like tabbed browsing, private browsing, live bookmarking, geolocation browsing, add on manager, download manager and advanced search which most of the browsers do not provide. This browser runs on various operating systems like Windows, Linux and Mac. Its usage tops in the countries like Germany and Poland. The browser developed by Google that uses WebKit layout engine is the third most popular web browser in the world. In UK, Chrome has pulled down Mozilla and is the second best browser when it comes to usage. The best browser for slow computers, Google chrome was introduced in beta version at the beginning which accelerated its popularity and people find it easy to use when it comes to browsing and downloading. This graphical web browser developed by Microsoft tops the list when it comes to usage among people. The browser is fast losing its popularity when it comes to user demand as the smart users have already switched off to other browsers like Firefox and Chrome. However, it's known for its better performance even in a weak hardware but when it comes to security features, they have been a failure. Opera is ranked the 4th best browser by the people in Ukraine for usage as they have great security features. This provides the highest privacy when compared to other browsers. Safari is a web browser developed by Apple Inc. and included with the Mac OS X and iOS operating systems. First released as a public beta on January 7, 2003 on the company's Mac OS X operating system, it became Apple's default browser beginning with Mac OS X v10.3 "Panther".It is Ranked 5th. Earlier today, Mozilla said it is cracking down on sluggish Firefox add-ons that greatly slowdown the performance and speed of the popular open source browser. Recently, Mozilla's group has been getting more complaints of its browser becoming sluggish. Mozilla then added that within the next two weeks, it will add a warning to any add-on that slows Firefox's startup time by more than 25 percent, and in an upcoming version of the browser, third-party add-ons won't be installed unless the user specifically approves the installation first hand. "It’s an all-too-common practice of third-party software to install all kinds of so-called toolbars and other endless bundled add-ons in your browser without permission," Mozilla says. "We know that these add-ons account for many if not most of the performance issues reported to us, and Firefox users often don’t know how the add-on got there in the first place or how to remove it." Requiring approval for the installation of all add-ons, Mozilla believes, will have a huge impact on performance. Every week, Mozilla will run automated performance tests on the top 100 add-ons in its add-on gallery, and it will display the results on its site. After the first round of tests, the slowest performing add-on is the hugely popular website debugger, Firebug. According to Mozilla's stats, Firebug slows startup by at least 75 percent, and sometimes even more. Ironically, the seventh slowest add-on is inappropriately called "Fastest Fox". It's designed for speedy browsing, but it generally slows startup time by 31 percent or more depending on the speed of the computer's CPU and overall memory installed. And in the coming months, Mozilla will also provide tools to help developers and that will allow them to test add-on performance on their own side, and it will be contacting other developers whose add-ons are seriously increasing the startup time of the open-source browser. "Firefox overall performance is extremely important to our users, especially how quickly it starts up and loads websites," Mozilla says. "Customization is also very critical, and while most add-ons cause only a small performance impact, others can still significantly slow down the browser. Many users don’t realize add-ons can cause these delays, and that’s why we’re truly committed in improving performance, and to reduce if not completely eliminate these issues." Mozilla added that it will eventually test all add-ons as they're submitted to the gallery, and it will further expand testing to measure overall load times. In other browser news, Opera said in January that it repaired its browser to remove a cross-platform security vulnerability that created a potential mechanism for attackers and hackers to inject malicious code into vulnerable Windows systems. The critical security flaw stemmed from bugs in handling large form inputs, as explained in an advisory by a Norwegian software developer. Version 11.01 of the browser also addresses two less serious security holes.